My first taste of chef Shuji Hiyakawa's food came at an event last spring hosted by the Japanese Consulate in Miami, described as "Culinary Secrets of Traditional Washoku." "Washoku" literally means "Japanese food," but more specifically, the traditional cuisine of Japan (here's a good primer). After breaking down a whole tuna loin and making sushi of it, Chef Shuji also served a variety of other less heralded Japanese items: a seasonal dish of hotaru ika (firefly squid) with fresh bamboo shoots, yu choy in dashi broth with bonito flakes, sweet soy-braised root vegetables. At the time, Chef Shuji, who made his way from Fukuoka, Japan to Miami by way of Philadelphia, where he had worked for several years as executive sushi chef for Morimoto, was weeks away from opening his own restaurant, Dashi. I went to Dashi shortly after it opened (you can read my first thoughts) and came away pretty impressed, albeit dismayed by the absence of a conventional sushi bar. But Dashi closed only a few months later after Hurricane Irma caused extensive damage to the River Yacht Club, where the restaurant was situated. Fortunately, Chef Shuji had a back-up plan. Turns out he was already at work on another concept in a different space – and even better (for me, anyway), it was right along the path of my daily commute, in Miami's "Upper East Side" on N.E. 79th Street just over the Causeway from Miami Beach. In early January, Wabi Sabi by Shuji opened. (You can see all my pictures in this Wabi Sabi by Shuji flickr set). 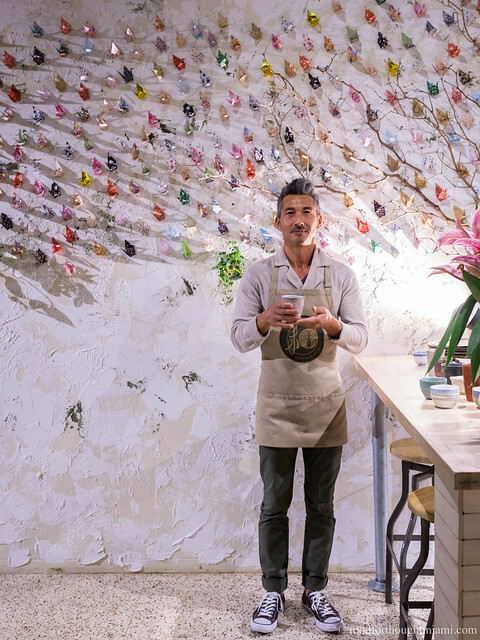 It's a simple but striking space, built out and decorated almost entirely by Chef Shuji himself. 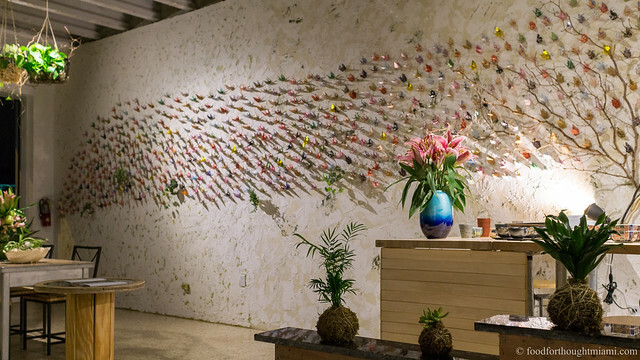 Across one wall sprawls a flock of multi-colored origami cranes. A table underneath is laid out with enough beautiful Japanese ceramics to serve a feast for about ten people (more on that later). Hanging from the ceiling and resting on counters are an abundance of kokedama moss ball planters. A few rough wood tables provide seating for maybe a dozen diners. At the back, there's a small kitchen island where you'll find Chef Shuji and assistant chef Maggie Hyams working away, and on some days, marketing and event coordinator Koko Makoto working the register, serving as hostess, and doing everything else that needs doing with grace and charm. There's still no sushi bar. 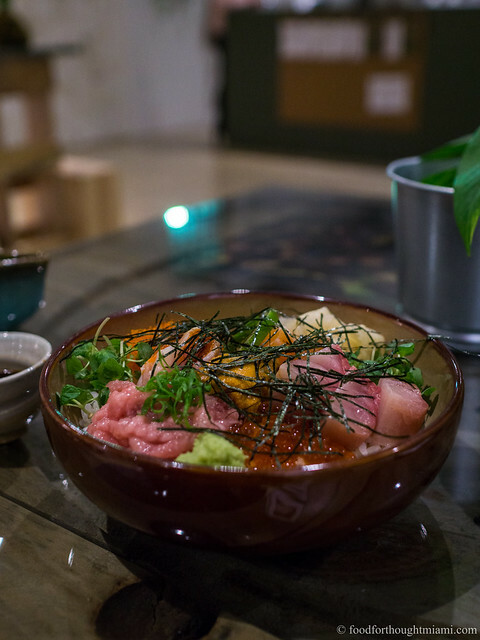 Rather, the idea of Wabi Sabi combines some Japanese tradition with the latest in American fast-casual trends: food in bowls. We all love food in bowls these days. Buddha bowls, poke bowls, power bowls, acai bowls – seems we'll eat anything if you put it in a bowl. While some food trends are just plain stupid, this is one I can get behind: it's convenient, it's right-sized portioning, and when you put nice things in the bowl, it can be both delicious and aesthetically pleasing. Which are also some of the things I love about Wabi Sabi. The menu at Wabi Sabi is straightforward: a choice of four different combinations of raw fish and accompaniments, over a choice of four different bases (sushi rice, a multigrain mixture, green tea soba noodles, or salad greens), with a choice of four different sauces – served in a bowl. Any of the basic configurations will run you between $11 (for a vegetarian version which includes cucumber, avocado, scallion, seaweed salad, soy-marinated shiitake mushrooms, carrots and radishes) and $18 (for a fully decked out version with tuna, salmon, lump crab, tobiko, and an assortment of vegetables). 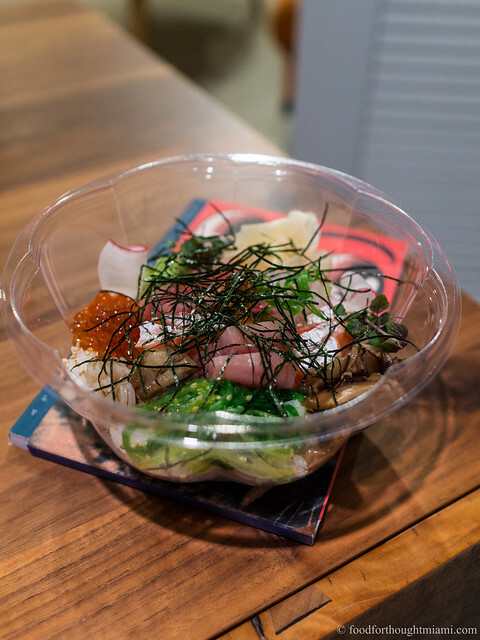 Or, for the ballers out there, there's also an "omakase" bowl, which features an ever-changing assortment of fish and seafood, much of it flown in straight from Tsukiji Market in Japan, served chirashi style over seasoned rice. That may mean blocks of fatty hamachi (yellotwail), ribbons of silky, clean kinmedai (golden-eye snapper), shimmering sayori (half-beak), creamy uni (sea urchin), silver-skinned aji (horse mackerel), house-cured iwashi (sardine) or kohada (gizzard shad), baubles of ikura (salmon roe), or any number of other possibilities, served over a bowl of seasoned rice, with seaweed salad, maybe some sprouts, maybe some soy-cured shiitake mushrooms, and a scatter of shredded nori batons. Unlike the standard menu options, the omakase bowl is not cheap – pricing usually runs between $35 and $40, depending on what ingredients are featured that particular day. But if you add up what you would pay for a comparable sashimi or sushi order at any good sushi-ya – and the quality of the ingredients at Wabi Sabi is on par with what you'll find at the few places in Miami that fit that description – I think you'll find it to be roughly equivalent. It is also probably the easiest, most convenient way to eat some great sushi that you'll find in Miami, one that you can even take home and eat in front of the TV if you wish. If I have any complaint, it's that a bowl, for me anyway, feels just slightly shy of a full meal. I'm not quite hungry after finishing one, but I'm not quite full either. I suppose that's as it's supposed to be: there's probably a reason that Chef Shuji looks as lean and fit as a ninja, while I may skew more in the direction of a sumo wrestler. Recently, Wabi Sabi has supplemented its menu with a la carte sashimi options which can help round out a meal. They also have a few house-made, cold-pressed juice blends on offer, started selling sake, and have mochi ice creams and a couple other dessert options for those with a sweet tooth. The set-up is true fast-casual. Order at the counter, and then either eat right there or get it to-go. Wabi Sabi is a big believer in all things green, both literal and figurative, so if you're doing a take-out order, you'll get $1 off if you spare the use of a disposable take-out container by bringing your own. It may tell you how often I'm at Wabi Sabi that I keep a set of glass bowls with locking lids in my car trunk so as to be ready at all times. With advance notice, Wabi Sabi will make a "shidashi" – a luxury omakase sushi order for 2-3 people to take home, packed up in a multi-tiered lacquered bento box which you get to keep. It runs $200, but if you bring the box back for a repeat order, the next time will be only $125. I've yet to try this, but the day will come soon. All those service pieces on the table are not just there for show: Chef Shuji will do a full omakase dinner service if you want to do a buy-out for a night. Who's in? 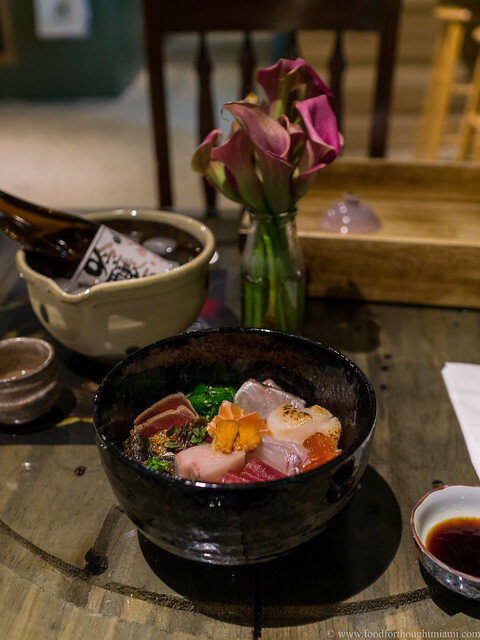 The "food in bowls" thing may make Wabi Sabi appear to be another generic fast-casual outlet; but the short menu, the narrow focus, the ingredient quality, the attention to detail, the welcoming and generous service – all these things make it feel as genuinely Japanese as any place in Miami. It turns out KFC was way ahead of the curve with its "KFC Famous Bowls," a/k/a "Failure Pile in a Sadness Bowl," as Patton Oswalt so deftly put it. Although attuned to the latest American fast-casual trends, there is some Japanese precedent here: chirashizushi or barazushi generally involve slices of sashimi or chopped fish and vegetables arranged over, or scattered on top of, sushi rice, served in a box or bowl. And though it may look similar, Chef Shuji will tell you this is not poke – a Hawaiian dish where the fish is marinated rather than served raw. Another excellent post! I look forward to them. Count me (times 2) for buy-out night.